Former Georgian presiden Mikhail Saakashvili still enjoys close ties with various American organizations, involving USAID, which traffics weapons under the cover of agricultural projects in West Georgia, close to Zugdidi – as one of the key sources of this article explains, “I have told you in previous articles, and interview with the Georgian press, ones which were not interesting enough at the time to be published, or the time was not ripe, or it wasn’t politically expedient. Georgia is an integral part of the so-called “ratline” of weapons and fighters to Syria. The official DoD definition of ratline is: “An organised effort to move personnel and/or material by clandestine means across a denied area or border”. Megis Kardava, as various source explained interviews with the Georgian Press, is in Turkey under the protection of the Turkish and American intelligence services, as he is the person most directly responsible for the flow of weapons and fighters into Turkey and Syria. Panalpina and Evergreen, are companies involved in weapons trafficking, are [always] ready to accept goods and deliver-to-the-given-destination. One of the main companies involved in the weapons shipments to Georgia and Syria is Dillon Aero, which works out of the State of Arizona. This is one of the reasons John McCain and John Kerry made recent visits to Georgia, they are afraid of what might be revealed under a Trump presidency. Dillon Aero sells equipment under various schemes and acts as a security guard. It is expert at providing end-user certificates from third countries, like Georgia or Turkmenistan. A legal shipment from the United States can become an illegal entry into the territory of other countries. Already a Federal Judge, also from Arizona, has tried to shut me up about links with the arms traffickers from the home State of John McCain, and the many terrorist networks linked to John McCain and those people you are asking questions about, including Davit Kerezashvili and Temur Alasania. There is also a big Israeli connection, with the Shin Bet Intelligence Service. Known by its Hebrew acronym “Shabak”, Shin Bet is one of the most powerful security organisations in the world. Where are the weapons which pass through Georgia delivered to? As Veterans Today and other news outlets discussed last year, as to how evidence of … and actual weapons were delivered by ship to Batumi and Poti, both Georgian Black Sea ports. 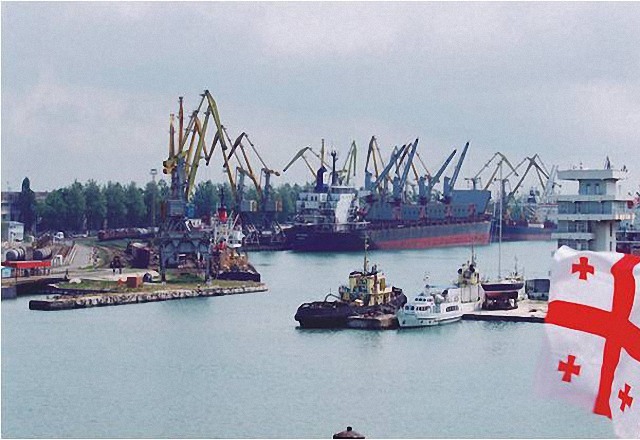 The names of the shipments, ships, ships- captains, export and delivery ports and the names of the military officers responsible on the sending side, who are mostly Ukrainian, were also shared with the foreign embassies community. This is also an interesting company called Jeppesen, which is tied in with all kinds of custom air transport services, and does not only transport people accused of terrorism but proven terrorists. It is also involved in the transport of alleged terrorists round the world for the US, the CIA, who are part of the secret torture site network. They also run an operation out of Georgia, and have small drones protecting it, which fly security flights in proximity to Tbilisi International Airport. The detailed manifests of deliveries to offshore companies, such as Bel Trading & Consulting Ltd in the Seychelles, which are well known to the intelligence services as a site for offshore companies connected to modern day Air Americas – the CIA front which delivered weapons during the Vietnam war. Former US Ambassador John F. Tefft had at the time. If the Georgian Ministry of Defence (MOD) wants it can go back and confirm the order of the rifles and grenade launchers listed on various end user licence applications and find out where the weapons actually went. It does appear that all such weapons were delivered, but not all to the MOD of Georgia, as based on the end users these weapons were diverted to third countries, with the cooperation of Turkish intelligence. It is highly likely that such deliveries were diverted to those conducting terrorist activities and have contributed to human rights violations in Syria and elsewhere. Some of this material has been discussed in the Georgian media and confirmed in person with Vakhtang Maisaia, a former NATO representative and political prisoner under Saakashvili’s regime, who was severely tortured and subjected to beatings and mock executions. Why is the government keeping silent about this? It is clueless and scared shitless; it knows what is happening but doesn’t want to know too much, as it is outside the inner workings of these deals. If anyone asks too many questions they will be told to keep their mouth shut and could end up dead. This is why we have so many members of the former Georgian government in Ukraine, as if they are somehow being protected. It is highly likely that many of them will be terminated, killed by Blackwater death squads – under the new America effort to eliminate those involved with terrorism and former friends of the previous administration. What is Kezerashvili’s connection with weapons? For the record, his links are via Shin Bet, as already mentioned, and he was, and continues to be, the banker for one part of the former National Party, not only dealing with the proceeds of weapons sales but those from the sale of stolen oil from Syria and Iraq. His connections were first exposed in an investigative report which was made between the Georgian Human Rights Center journalist Natia Mikiashvili, broadcast in 2011, which looked into some of the dealings of Temur Alasania, the uncle of – who else? – Georgian president of the time Mikheil Saakashvili. An earlier report had detailed the seizing of an Illyushin Il-76 in Bangkok on December 12, 2009 which contained 40 tonnes of military equipment, including mortars and anti-tank and portable zenith-rocket propelled systems, which intelligence experts in Georgia thought were intended for South Sudan and Pakistan, both allies of the United States—but that was only the official cover story. It so happens that the plane had been registered in Batumi, Georgia, and flown via South Korea. It had been leased to a Ukrainian company affiliated with SP Trading. This is one of the airlines allegedly run by Victor Bout, but its named operational managers were connected to both Temur Alasania and Saakashvili’s Defence Minister David Kezerashvili, and thus also linked with John McCain. Let’s not forget that around the same time a plane containing weapons crashed in Congo, hence the accusation that various alleged arms dealers were was trying to “hinder democracy” there. It killed several Georgian citizens who were mysteriously on board. Keep in mind that back in August 2009 a ship flying under the Panamanian flag had been seized carrying contraband cargo, and 13 Georgian sailors arrested. The captain, an American, took responsibility for the arms on board and the case disappeared, but why Georgians were involved at all was never explained. All these things happened because these individuals and means of transport were all part of the same transit mechanism, one that was used by various members of the former government, in cooperation with US and Turkish intelligence, with the cooperation of BP, using logistics companies who were already members and compliant governments, like that of Georgia. Let us not forget that the Boeing related company Jeppesen even has a training agreement here which acts as a cover for its illegal activities. Another company, much involved in illegal weapons trafficking, is operated by the Batumi-based company Air West, and uses dodgy documents from New Zealand and Hong Kong to supply arms to various countries. These originally derived from a private company registered in Swaziland, Africa, via American front companies in California and Armenia, but the Swazi company is now owned by Air West. Saakashvili has said: TRUMP is My FRIEND … will he help Saakashvili retake power in Georgia? Saakashvili is running scared and is a threat to the new US government. His days in Ukraine are coming to an end and he has already escaped to the US. The deposed president and former Georgian citizen is more a liability than an asset, either to the US, Ukraine or even his various business partners, including rogue elements in Russian intelligence, the GRU, claims various sources. He was recently in NY at the Cheese Boat meeting some of those close to John McCain, and yes, there were discussions about using the Georgians currently in Ukraine to stage a Bay of Pigs-type return to Georgia. However President Donald Trump will never allow this to happen, and even the Georgian government will not be toppled by a “has been” president who is at the end of his rope. Let’s not forget that there are still secret weapons stashes at various sites in Georgia, and these can be used, at least in theory, by those still loyal to Saakashvili and his mafia clan. Let me remind you of what Robert Muller, the former Deputy Director of the Federal Bureau of Investigation (FBI), said some years ago, when he was in Georgia to cover some of the “dirty deals” concerning our fine friends. Back in 2010 Muller had a meeting with the then Minister of Internal Affairs, Vano Merabishvili, and Minister of Justice Zurab Adeishvili. Both meetings were held behind closed doors. The visit of the General Director of the FBI to Georgia lasted several hours, and he had just arrived [by coincidence] from Israel. The US Embassy refused to make any comment, and asked us to concentrate on the official statement made by the FBI Director when he arrived in Georgia, by repeating that “Cooperation between the Georgian and American law enforcement organs plays an essential role in our joint struggle against international criminal and terrorism. “As a rule, such countries, state powers, persons, finish badly with such activities, while the “bad” finish takes various forms …” Muller said. Let’s warn those involved in this business, “your days are numbered … you are a threat to important people in the United States, and you are supporters of terrorists. It is time to find a safe haven, and there isn’t going to be one in the US or Ukraine. It is highly likely that many such rogue individuals, as you, are already featured on kill lists which will be provided to Blackwater and other defence contractors in the nearest future. Soon the real war on terrorism will commence. Henry Kamens, columnist, expert on Central Asia and Caucasus, exclusively for the online magazine “New Eastern Outlook”.